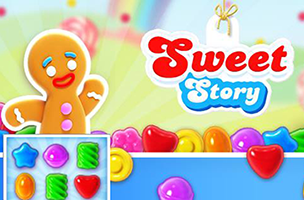 Alongside the popularity of Candy Crush Saga, another candy-themed match-three game is climbing up the charts on Facebook, as Sweet Story has reached over 327,000 monthly active users (MAU). The game had just under 55,000 MAU on January 30. Sweet Story sees players rebuilding Sweet City by completing match-three levels to find building materials. Each level may have a different goal, from making a set number of total matches to breaking a certain number of individual candies, among others. Power-ups are added to the board as players make matches of four or more like-colored candies, or special matches in “T” or “L” shapes. These may cause explosions on the board, or can clear whole rows and columns of candies. Each building in Sweet City contains its own match-three stages, which become more complicated as players progress. That is, one level may contain jelly squares that must be cleared by making matches on top of them, while another contains frozen candies that are destroyed by making a match with the frozen tile. At the end of each level, players receive materials for constructing additional buildings, which are also used to complete quests. An energy system limits the length of a single gameplay session, but premium currency (that is, real money) can be used to purchase new energy instantly. Sweet Story is available to play for free on Facebook. Check back soon to follow the game on AppData, our tracking story for mobile and social apps and developers.